New! Introducing a professionally designed motorcycle plans (200 series chopper style) -- so you can build your very own killer old school motorcycle. Frame was tested with a load of 10,000N force loaded on the center support for the seat as well as the center support for the engine. 10,000 N = approximately 1000 kg or 2200 lbs. The motorcycle plans will be printed and delivered 36" x 72" in size. "Sectional" views make our motorcycle plans unique: Sectional views shows you how the frame would look if it were cut at a specific plane. This gives you a tremendous advantage because it's the only way to specify the compound bends and angles. Other plans show you multiple horizontal and vertical dimensions on multiple views which is very hard to understand, cluttered, and sloppy. 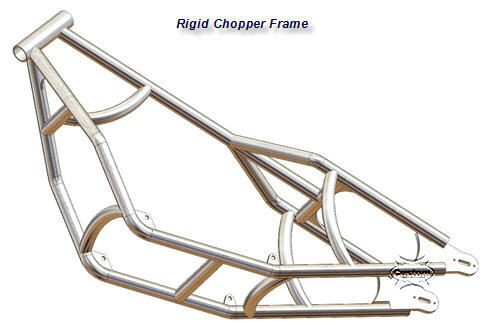 The motorcycle frame plans you will get reveal angles clearly instead of multiple dimensions on the front and side views. 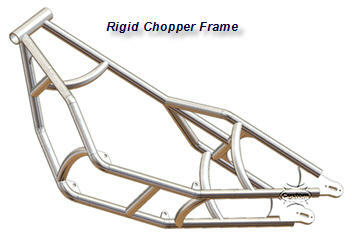 A builder should be able to look at our motorcycle plans and create a frame without any problems. These drawings are very crisp, clean and clear and it makes the drawings look nice and they are much MUCH easier to follow than anything else you will find, guaranteed. How Much Are These Chopper Plans? As you will discover, these motorcycle plans are the best on the market because other motorcycle frame designers simply don't have the skill or education to create plans that have multiple sectional views and organized in a way that makes them fun and easy to follow. These plans are unique in many ways (see below). Notably, they were designed by our senior design engineer who used cutting edge (enormously expensive) software that requires months of training to use, and he had his worked triple checked by another engineering department.